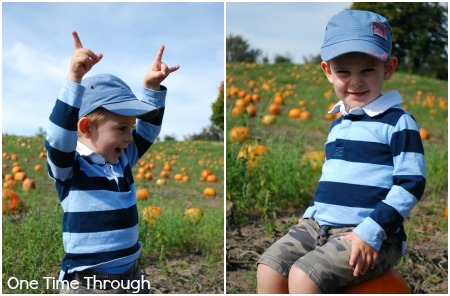 If you haven’t visited the pumpkin patch yet this Fall – here are some compelling reasons to go with your little ones! Believe it or not, I had never been to a pumpkin patch until this past week. It’s always been on my to-do list, but just hadn’t happened. Last Sunday was sunny, and warm and my family decided to go apple picking. When we arrived at the orchard, we discovered there was also a pick-your-own pumpkin field. This was the time! And Onetime was excited (can you tell?)! Aside from lots of picture-taking, we had a terrific hour wandering around the fields looking for just the right pumpkins. We picked a tall, skinny one for Daddy and a short, plump one for me, and Onetime found a tiny cute one for him! Just perfect! 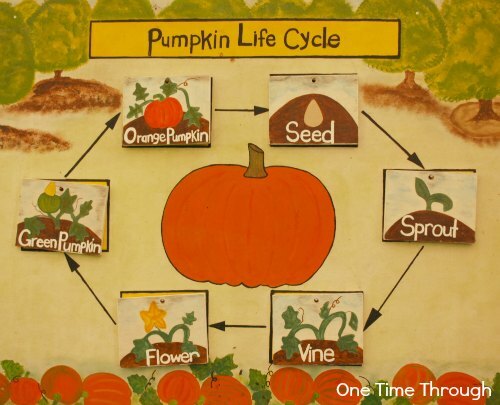 We also took some time to look at this informative pumpkin life cycle board together. It was neat to see that some pumpkin vines were still flowering even while there were huge pumpkins in the field at the same time. 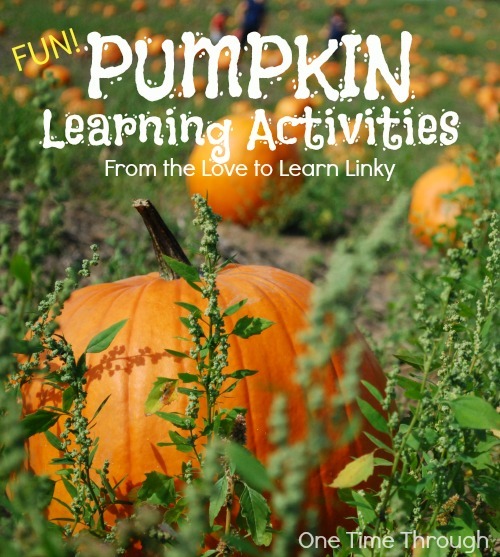 Long story short, we haven’t carved our pumpkins up quite yet, but I did find some awesome learning activities to try with them right here on the Love to Learn Linky last week. Check them out! 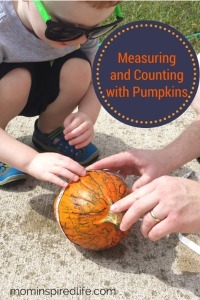 Mom Inspired Life has a great post on Measuring Pumpkins with preschoolers. 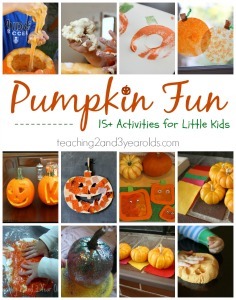 Teaching 2 and 3 Year Olds has a large roundup of fun and educational Pumpkin Activities. I LOVE this list of fun and educational things to do with Mini-Pumpkins from Spark and Pook – especially the pumpkin sorting and patterning activities. 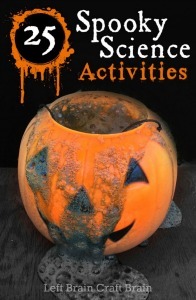 Left Brain Craft Brain has a roundup of Pumpkin-Themed Science activities! 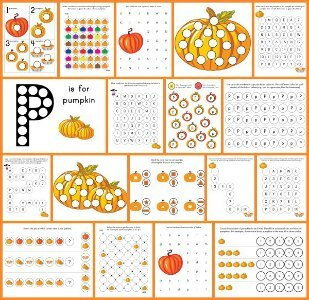 Planet Smartypants has another roundup of Ways to Learn with Pumpkins including a fun Pumpkin Geoboard activity! 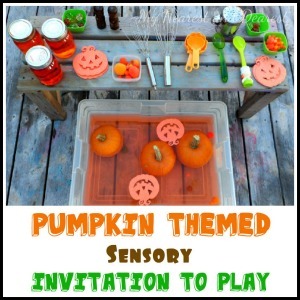 Here’s a hands-on Pumpkin Sensory play idea from My Nearest and Dearest. And just in case you can’t make it out to the patch, here are some pumpkin learning ideas that you can do from home! 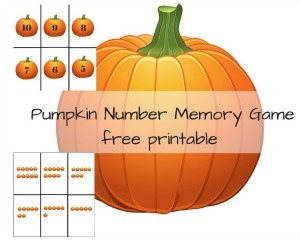 Check out this simple Pumpkin Memory Numbers Game from Stella 123. 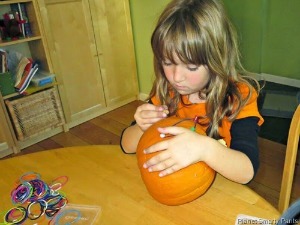 Gift of Curiosity has some fun FREE Pumpkin Do-a-Dot Printables. That’s it for this week. 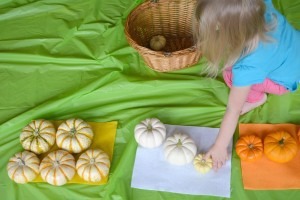 Hope you found some inspiring ideas to get you out to the Pumpkin Patch with your child! And thanks again to all the fabulous bloggers who keep linking up and sharing their wonderful ideas. If you’re looking for even more early reading ideas for preschoolers – be sure to check out our Autumn Crafts and Activities Pinterest board at: Follow One Time Through’s board Autumn Activities and Crafts on Pinterest. What fun pics of OneTime! And thanks for including our Halloween science. Thank you for the feature! Great round-up!